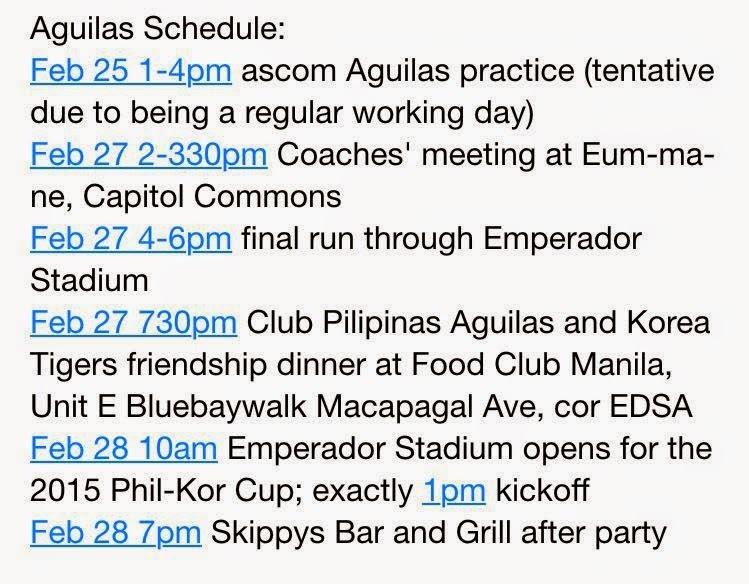 The American Tackle Football Association of the Philippines (ATFAP) formed our own National Team called the Pilipinas Aguilas for the American Football sport. 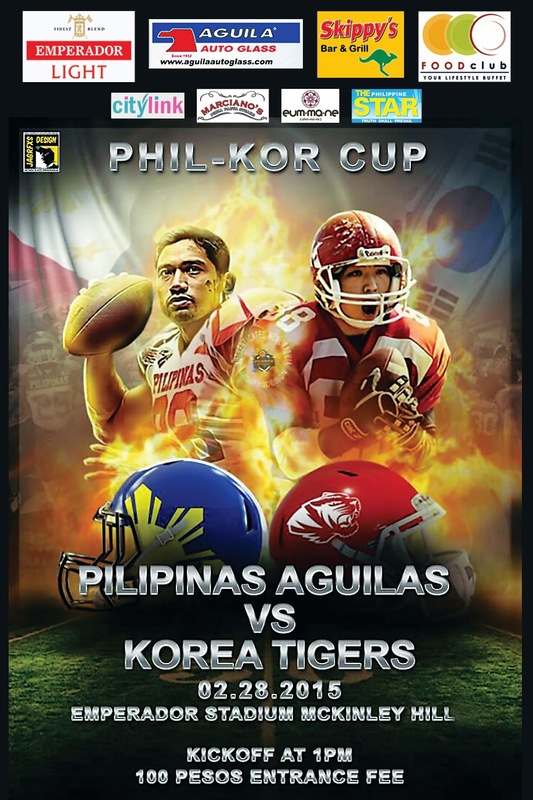 The Pilipinas Aguilas and the Korean Tigers will compete at the Phil-Kor Cup, an international friendly game to be held on February 28, 2015 (Saturday) at the Emperador Stadium in McKinley Hill, Fort Bonifacio, Taguig City. 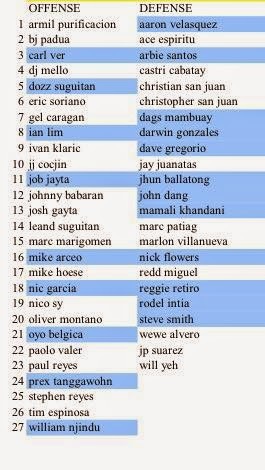 The 50-man Pilipinas Aguilas delegates went to Tokyo, Japan last April 26, 2014 to face the long time dominant force of Asia and in the world for the qualifying game of the 2015 World Football Championship in Sweden. The Philippines lost by a big margin, but that was expected from just a mere 3-month program from the Philippines against the 80-year program from Japan. Now the Pilipinas Aguilas knows where it stands and the training all players need. The national team is more committed on building their program and seriously training hard. In just 6 months of the program, they have already invited 2 international teams to train their players and at the same time have a full international friendly game. Last August 2014, they have invited the Western Australian Raiders to the country to teach the local participants and at the same time play against our National Team training pool, the Club Pilipinas Aguilas. They lost the game but this program gave the first touchdown of the Aguilas. This ImPACT Program (I Am Pilipinas Aguilas Club Training Pool Program) will have its second test run as the Club Pilipinas Aguilas takes on the Korean Tigers for an international friendly game dubbed as Phil-Kor Cup on February 28, 2015 at the Emperador Stadium, McKinley Hill, Fort Bonifacio. This was revealed in a presscon held at Skippy's Bar & Grill last February 20 which was hosted by Apollo Angco, also a member of Pilipinas Aguilas team. Football has been a very active sport in Korea for over 50 years now. Canadian Head Coach Lawrence Bowlby has been training the Korean Tigers team on its 4th year now. The Aguilas will surely learn a lot from this game with the Korean team. The new Club Pilipinas Aguilas will be coached by American volunteers headed by Head Coach John Walker and Assistant Coaches Michael Bell, David Vannette and Braendon Clay. The Philippines is banking on these coaches to bring this team and the sport to greater heights. About twenty-two (22) players are expected to play from each team - 11 defense, 11 offense. The organization hopes that the Phil-Kor Cup will be an annual event. Tickets will be sold on the game day itself at the stadium's entrance gate for P100. Let's support this game! ATFAP has started its program for the development of American football in the country with the creation of the ImPACT Program. This American football club will be the official training pool for the National Team for official local and international games under ATFAP and the International Federation of American Football (IFAF). Under the ImPACT Program, any Filipino and foreigner can register and be part of the pool and undergo training to develop their individual fundamentals and skills under one National Team Club Training Pool called the Club Pilipinas Aguilas. The objective is to invite coaches, players and referees, both Filipinos and foreigners alike, who have experienced coaching, playing or officiating American football in any level (high school, college, semipro or international competitions). They will then voluntarily train Filipinos who want to excel in this sport and be part of the all-Filipino National Team called the Pilipinas Aguilas. Part of the training will be for both Filipinos and foreigners to play side by side in either a local mix-up game or an international friendly game because the only way for Filipinos to experience real American football is to play along with these experienced players first before they battle it out against foreign teams. This is a way of sharing football knowledge first hand. In order for Filipinos to be prepared to face international players, part of the ImPACT Program is to form an all-foreigner team coming from the Aguilas Club members. This all-foreigner team will be called the Day-U-Won (The day you won … against foreigners). In Filipino, it's "dayuhan" meaning "foreigner." The Day-U-Won Team will test these Filipinos in an annual game of real American football, testing what they have learned from their foreign teammates/mentors. Eventually, the pool of experienced Filipino players will now be chosen to represent the Philippines in official international games such as the 2017-2018 IFAF Asian Continental Championship and the IFAF Seniors World Championship being held every four years with the next being in 2019. Sponsors for this Phil-Kor Cup are Emperador Light, Citylink Coaches, Skippys Bar and Grill, Aguila Auto Glass, Marciano’s Pizza Pasta Steaks, The Philippine Star, Food Club Buffet and Eum-ma-ne. For the photos, you can view the Photo Album here.